Katy Perry (born Katheryn Elizabeth Hudson on October 25, 1984) is an American electropop singer-songwriter. She has released five studio albums and two EPs. In 2001, she released a Christian album named after herself, Katy Hudson. In November 2007, Perry released the music video for her first single, "Ur So Gay". She has a contralto vocal range. Perry became the most-followed person on Twitter in November 2013. She has earned nine number-one singles on the Billboard Hot 100, five of which are from one album (she became the first female artist to achieve this record). 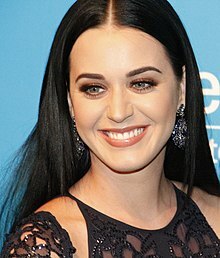 Perry has also been nominated for 11 Grammy Awards. Perry was born on October 25, 1984, to Maurice Hudson and Mary Hudson (née Perry), both pastors. She has an older sister, Angela, and a younger brother, David, who is also a musician. Perry has said that her upbringing was "sheltered" and that an example of this was that her family did not eat Lucky Charms cereal because her parents thought that luck was something that came from the devil. She also called deviled eggs "angeled eggs" growing up. Then known as Katy Hudson, she released a Christian album named after herself. It had the single "Search Me". She was discovered by Glen Ballard, who is known for his work with musician Alanis Morissette. This album did not perform well, and she was dropped from her record label, Red Hill, when the label was shut down. She struggled for six years before eventually signing with her current label, Capitol Records. After changing her last name to Perry (her mother's maiden name) so that she allegedly would not be confused with actress Kate Hudson, Katy released an EP album called Ur So Gay. This song has been criticized and labeled homophobic. On June 17, 2008, Perry released her first pop album called One of the Boys with singles including "I Kissed a Girl" (her first number-one hit), "Hot N Cold", and "One of the Boys". She co-wrote the single "I Do Not Hook Up" for singer Kelly Clarkson (the first winner of American Idol), along with the song "Rock God" for singer-actress Selena Gomez. Perry's third album, Teenage Dream, was released in August 2010 and included the singles "California Gurls", "Teenage Dream", and "Firework". She is the only female artist to get 5 number-one singles from one album on the US Billboard Hot 100. Along with the album's first three singles reaching the top, "E.T." featuring Kanye West and "Last Friday Night (T.G.I.F.)" also hit number one. The only other artist to get 5 number-one songs from one album is Michael Jackson, with Bad. She was inspired by her then-engagement to British comedian and actor Russell Brand. At the Grammy Awards in 2012, Perry performed a new song, "Part of Me", that was released as the lead single from the re-release of Teenage Dream, called Teenage Dream: The Complete Confection. The song entered at number one on the Billboard Hot 100, becoming her seventh US number-one hit. The next single, "Wide Awake", reached number two in the US and topped the Canadian Hot 100. In July 2012, Perry released the concert film/biopic Part of Me in 3D. The movie shows her early life through the Teenage Dream era and her rise to fame. On November 30, 2012, Perry went to the 2012 Billboard Women in Music event. She was given the Woman of the Year Award there. In August 2013, Killer Queen, Perry's third fragrance, was released. Perry collaborated with fellow American pop star Britney Spears to write the song "Passenger" for Spears' eighth studio album, Britney Jean. Perry's fourth album, Prism, was released on October 18, 2013. It reached number one in 83 countries. The first single from the album, "Roar", was number one in Australia, Austria, Bulgaria, Canada, Croatia, Ireland, Israel, Lebanon, New Zealand, Scotland, South Korea, the United Kingdom, and the United States. Perry performed the song at the 2013 American Music Awards. On November 10, 2013, she performed the album's second single, "Unconditionally", at the 2013 MTV Europe Music Awards. On December 5, 2013, Perry's single "Roar" was nominated for the 2014 Grammy Awards for Song of the Year and Best Pop Solo Performance. She performed at The GRAMMY Nominations Concert Live! On May 7, 2014, Perry began the Prismatic World Tour in support of her fourth studio album, Prism. The album's third single, "Dark Horse", featuring rapper Juicy J, became Perry's ninth number-one single in the United States. It was the second-best performing single of 2014 there. In 2016, she released the single "Rise" in support of the Rio Olympics. Two music videos were released: one with an Olympic theme and one which depicts Perry with a red parachute. The song reached number one in Australia and the top twenty in the US and Canada. On February 10, 2017, Perry released the single "Chained to the Rhythm", which reached the top five in many countries worldwide, including the US, UK, and Canada. It features the grandson of Bob Marley, Skip Marley, and was co-written by Australian singer-songwriter Sia. Two months later, the single "Bon Appétit" was made available for download. The hip-hop group Migos is featured on this song. "Swish Swish" (featuring Trinidadian-American rapper Nicki Minaj) and "Hey Hey Hey" were released as the album's third and fourth singles, respectively. "Swish Swish" became certified platinum in the US. In May 2017, Perry announced that her fifth studio album would be released on June 9 and is called Witness. She also announced Witness: The Tour, a concert tour that will begin in North America in September 2017. During the weekend of the release of Witness, Perry partnered with YouTube and held a 96-hour livestream event called "Witness World Wide". In the stream, Perry was recorded over four days throughout her daily life in a house she rented in Los Angeles. She held segments which featured celebrities, like British talk show host James Corden, Huffington Post founder Arianna Huffington, and YouTuber Gigi Gorgeous. Perry could also be seen crying in a therapy session. She claimed she got rid of her long, dark hair in favor of a new, short and blonde hairdo at a time where she questioned whether she still wanted her fame and did not "want to be Katy Perry anymore." The livestream gained over 49 million views on YouTube. Perry married British comedian and actor Russell Brand on October 23, 2010. However, the two divorced in December 2011. She previously dated Gym Class Heroes lead singer Travie McCoy. ↑ Greenburg, Zack O'Malley. "Katy Perry's Net Worth: $125 Million In 2016". Forbes. ↑ By. "Katy Perry dethrones Justin Bieber on Twitter". CNN. ↑ "5 Things You Didn't Know About Katy Perry". Vogue. ↑ "Remember When Katy Perry Was a Christian Music Artist?". Complex. ↑ Clout, Laura (August 8, 2008). "Katy Perry's song about lesbian kiss sparks homophobia claims". The Daily Telegraph. London: TMG. ISSN 0307-1235. OCLC 49632006. Retrieved April 14, 2011. ↑ "News - Entertainment, Music, Movies, Celebrity". MTV News. ↑ "australian-charts.com - Katy Perry - Roar". australian-charts.com. ↑ Hung, Steffen. "Katy Perry - Roar". austriancharts.at. ↑ "Katy Perry - Chart history - Billboard". www.billboard.com. ↑ "The official lebanese Top 20 - Katy Perry". The official lebanese Top 20. ↑ "Official Singles Chart Top 100 - Official Charts Company". www.officialcharts.com. ↑ "Digital Spy - Showbiz news, showbiz pictures, showbiz interviews". Digital Spy. ↑ "Watch Katy Perry's 24 Hour 'Witness World Wide' Live Stream". PopCrush. Retrieved February 18, 2018. ↑ "Katy Perry's Witness World Wide Generated Over 49 Million Views". Billboard. Retrieved February 18, 2018. ↑ Staff, Hollywood Life (October 23, 2010). "Katy Perry Marries British Beau Russell Brand In Lavish Indian Wedding Ceremony!". ↑ "Russell Brand Talks Doing Drugs, Katy Perry Marriage In Details Magazine". huffingtonpost.com. March 23, 2011. Retrieved April 14, 2011. "I Kissed a Girl" · "Hot N Cold" · "Thinking of You" · "Waking Up in Vegas"
"California Gurls" · "Teenage Dream" · "Firework" · "E.T." · "Last Friday Night (T.G.I.F.)" · "The One That Got Away"
"Part of Me" · "Wide Awake"
"Roar" · "Unconditionally" · "Dark Horse" · "Birthday" · "This Is How We Do"
"Chained to the Rhythm" · "Bon Appétit" · "Swish Swish"
"Goodbye for Now" · "Starstrukk" · "If We Ever Meet Again" · "Who You Love" · "Feels"
"Ur So Gay" · "One of the Boys"
This page was last changed on 7 April 2019, at 02:19.